I´m stunned by the amount of negativity and toxicity that this forum has. It feels sad that you can´t open a topic in "general" and have a respectful reply when you´re wondering about something that are pretty general to the game. The thread might have been about the maehwas upcoming class update but it could be have applied to patches in general if you were to spin it further. Calling out me and people that want the long awaited buffs envious and greedy kids are downright ignorant if not offensive. You´re not doing anyone any favours by spreading negativity, it will only result in that fewer people come to the forums which means a less active community. I will report the posts in this thread that has a negative attitude. Not that you guys will care, afterall, you have a tough-facede to remain. id say its only bad in game if you associate with channel chat. I used to get annoyed with the forums always being so toxic/negative but then i realized its really only a hand full of loud ppl causing most of the trouble. We will get the buff once they patch a few things. Such as fixing the issues with ninja's not blinking for the most part. This forum has awful moderation and allows people to be "forum heroes" and just troll to their hearts content without adding anything meaningful. It's a shame every single forum has awful moderation now a days, I don't think it'd be very difficult to moderate but it seems to be nearly impossible. I would say that you´re fairly accurate, unfortunately. Whoever that is in charge of monitoring the forums is doing a poor job from my point of view. Hiring new employees to look after the small engaged community is always good, even though it starting to look like they are just covering up the holes of a sinking ship. I find it frustrating that they don´t do more for us, or rather, with us. The best scenario would be "Oh, you like guys like this game, so do we(the employees behind it). Let´s work together to make it better". The scenario that we are going through now is that they notice worry amongst players, their numbers drop, the backers see the low numbers getting worried as well, the company hire new employees and post a blog and a welcome message so the community sees that they are admitting fault and trying to fix it. Days goes by, numbers are getting back ut, cycle goes starts from the beginning. One of the problems with the community stems from how things started. I won't call particular ppl out but bad decisions were made, bad actors encouraged it and half of them got banned or quit eventually anyway. Some people actually wanted this toxic soup of unmoderated bile, till this day a few people defend it fiercely because they are confused. They think moderation is censorship and all that. Also some people just want to be able to be exceptionally rude to people, because its the internet. They don't think that internet interactions are real, there are real people on the other end. And your a bad person for actually taking offense to said rude behavior. You are expected to stoop to their level. But they are the nicest people in RL, they promise. They are really caring and considerate, just not on the web. They days of quality MMO communities are over, you can blame both the management and the members. Anyway, love may Mae, can't wait for buffs. Are rangers getting a buff? Pretty much half the ranger population has quit so far, won't be long till every ranger rrs to another class. Why have you quoted me with this screenshot? Are you trying to imply that we do not need WP pots because we have a skill that restores a chunk of WP every 15 seconds? All that I seek is to be able to buy pots from a vendor like every other privileged class. All I mentioned in my original post was about WP users not having access to WP pots like every other class at the vendor. I find it annoying as I have to spend time making herbal juice when others can just buy it making it much more convenient for them. No idea why you are mentoring me on how to play my class. Please do show me evidence of you fighting others without a single WP pot though since you strongly believe we do not need them. Can't tell if troll or serious. I'm only a level 60 musa who's been playing the class since its release. But what do I know. ¯\_(ツ)_/¯ . Try to play that way in PvP, record it and post it here please. Laughing will help make the wait easier. I didn't quote you CarL. I also didn't say anything about Musa. 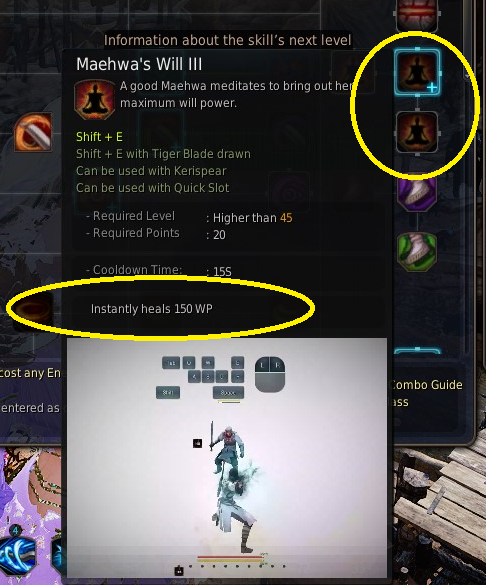 You can grind with Maehwa without using WP pots but it is extremely inefficient if you want to clear fast. Our skills that regain WP are either weak in damage (our basic stabs) or cooldown is too long. Moonrise restores some, but it drains faster than it gains. We can regain WP with our block, but that also takes away from efficiency. I would rather grind efficiently than slowly. So, yes, technically, you can play Maehwa without WP pots but it isn't convenient to do so. Don't even try to argue that you don't need them in PvP because why would you even try to avoid using them when you're trying to get a quick kill? I think preawakening Maehwa never really needed WP pots, but awakened Maehwa is an entirely different story and quite clunky if you don't bring pots. I've been playing Maehwa since release.